In the face of product recalls, brands need swift implementation and efficient management of customer support to minimize reputational damage. It’s an incredibly stressful time for any business but, as trusted advisors, we value our ability to implement and manage recall support teams with speed and proficiency, providing customers with the help they need when they need it the most. Percepta’s highly trained teams have designed and delivered product recall programs across the globe, from North America and Canada to Australia. It’s this broad but relevant experience that allows us to understand the complexities involved in deploying each program and the variations in recall legislation in each country where we work. Consistent across all our recall solutions, is our unique ability to deploy skilled and attentive teams of customer and vehicle experts to deliver quick and valuable support when customers are unsure about the recall guidelines or the impact this will have on both them and their product. We recruit, train and deploy these teams quickly, allowing us to be nimble and scalable, delivering support seamlessly to reduce stress for both the customer and our Client. In North America, we have managed a number of recall programs for our Volume Automotive Client of varying scales and complexity. 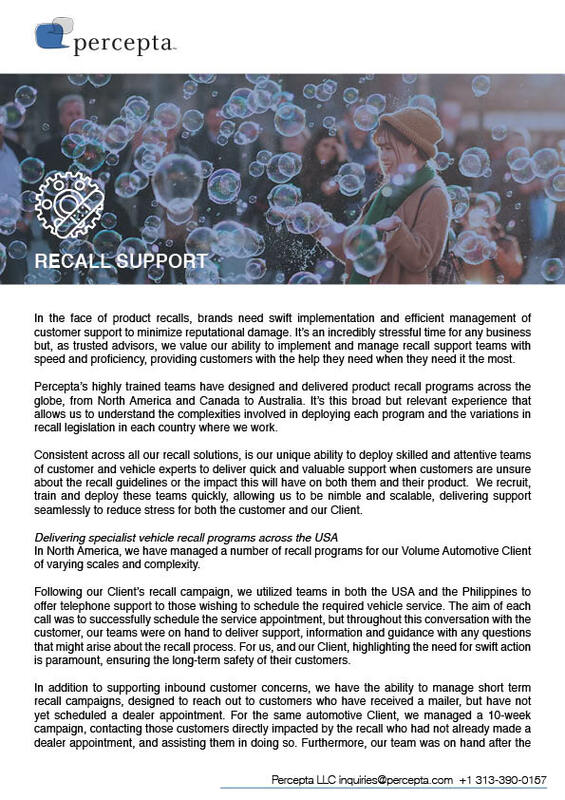 Following our Client’s recall campaign, we utilized teams in both the USA and the Philippines to offer telephone support to those wishing to schedule the required vehicle service. The aim of each call was to successfully schedule the service appointment, but throughout this conversation with the customer, our teams were on hand to deliver support, information and guidance with any questions that might arise about the recall process. For us, and our Client, highlighting the need for swift action is paramount, ensuring the long-term safety of their customers. In addition to supporting inbound customer concerns, we have the ability to manage short term recall campaigns, designed to reach out to customers who have received a mailer, but have not yet scheduled a dealer appointment. For the same automotive Client, we managed a 10-week campaign, contacting those customers directly impacted by the recall who had not already made a dealer appointment, and assisting them in doing so. Furthermore, our team was on hand after the appointment took place to follow up with the customer within two weeks to ensure the recall had been completed. While delivering these calls to customers, Quality Assurance measures were used to ensure the team was delivering the message to customers in the right way. Across the entire recall period, the team scored an average 94% when “Educating the customer fully and escalating when needed” – a vital part of the recall support we offered our Client!